Want to stop kids’ fighting? This book is for you. 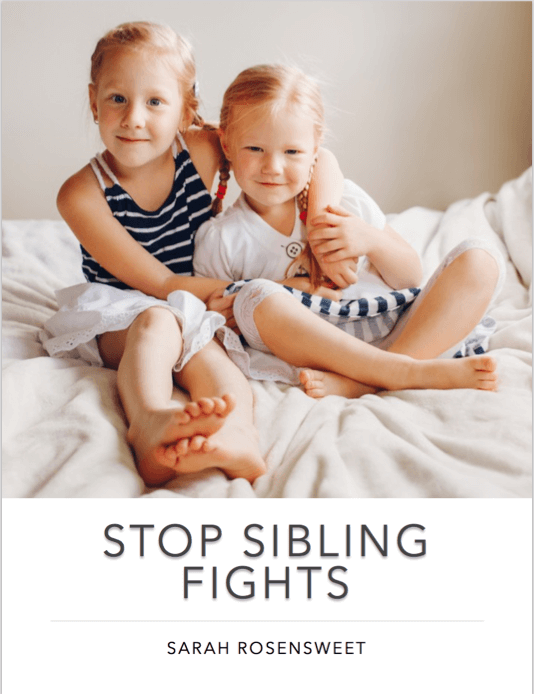 Sign up below to join my community and I will send you my *free* e-book, Stop Sibling Fighting. You can unsubscribe at any time. I just wanted to THANK YOU so much for your Stop Sibling Fights e-book. I read it about 3 months ago and your point of view was so new to me. I thought sibling fights were unavoidable. But learning more about sibling rivalry, I knew I had to do things differently. I have been coaching my 4 and 7 YO through conflict resolution for the past three months and making sure each one gets their turn to talk uninterrupted. Well, just this morning I overheard the big one say to the little one, “Wait, let’s try to figure this one out on our own.” I listened to them take turns to hear each other’s sides of the conflict and then come to a resolution. It was like I was in a dream. WHAT THE HECK!?!? Totally set the tone for an awesome day. I can’t thank you enough! We’ll start by looking at the root of sibling fighting and how to fix it. You’ll learn why you need to intervene in a sibling fight and how to do so in a way that teaches your kids great conflict negotiation skills. And if you’re doing all the things and it’s still tough? We will cover why. Our children can best friends or declared enemies for life- how we handle their conflict and respond to their feelings plays a large role in determining which one it will be.